Looking for a relaxing way to spend a crisp winter day? Search no further than Masters of Venice: Drawings by Giambattista and Domenico Tiepolo from the Anthony J. Moravec Collection. Hushed voices and deep indigo walls set the tone for this exhibition of 18th-century Venetian artists Domenico and Giambattista Tiepolo. As individuals and as a team, this father/son duo created paintings, prints, and drawings, as well as palace frescoes from Milan to Madrid in the 18th century. The Tiepolos' drawings of iconic biblical themes and playful, secular caricatures have a luminous quality that reflects the unique light of the lagoon city. In addition to 21 works by the Tiepolos, Masters of Venice features drawings by several other accomplished Venetian artists of the era, including Ubaldo Gandolfi and Giuseppe Bernardino Bison. Though certain artists — the Tiepolos, Boucher, and Fragonard among them — are well known to us, the 18th century is still being explored, especially in the world of drawings. This course examines the styles and subjects current across Europe in the age of the Tiepolos. As well as gaining a wider knowledge of Italian drawing, students will come to know traditions and innovations in drawings of the French, Dutch, and German in the 18th century. The Crocker's strong collection of 18th-century German drawings — perhaps the finest in the United States — will form a major counterpart to the Venetian art of the Tiepolos. Instructor: William Breazeale. Register here. 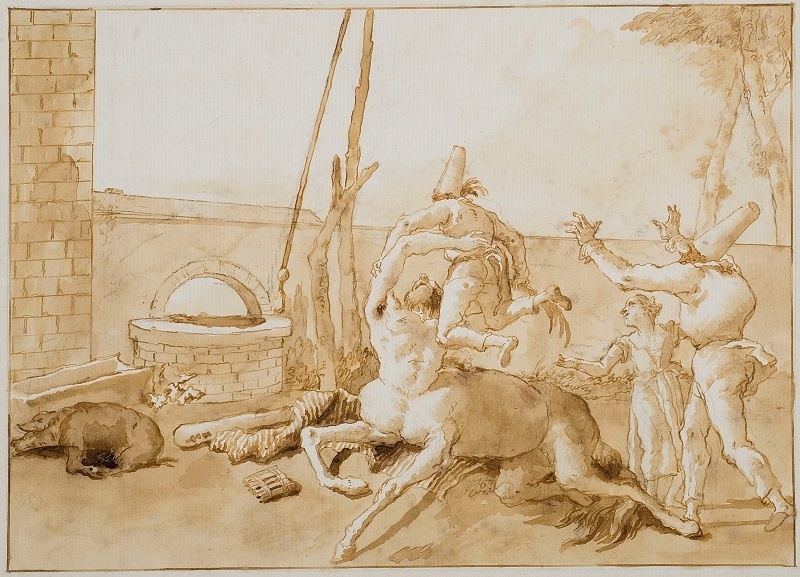 Cover photo: Domenico Tiepolo, A Centaur Playing with Punchinellos, n.d. Pen and brown ink, brush and brown washes over traces of black chalk on cream laid paper, 35.9 x 47.5 cm (14 1/8 x 18 11/16 inches). Eskenazi Museum of Art, The Anthony Moravec Collection of Old Master Drawings.